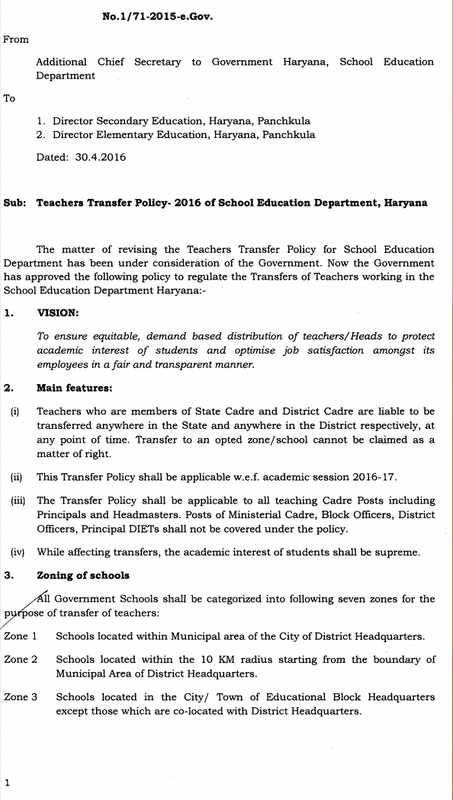 Govt.of Haryana has been announced the Teachers Transfer Policy 2016 0n dated 30.04.2016.This policy is available on website www.schooleducationharyana.gov.in under letter no.1/71-2015-e. Gov.This transfer policy is for all teachers of State cadre and District cadre.Transfers will be made on the basis of choices filled by teachers by online at DSE portal.This Transfer Policy shall be applicable w.e.f. academic session 2016-17.Teachers had been waiting this policy for a long time.A per letter issued by Special Secretary to School Education,School Education Department Haryana this Transfer Policy shall be applicable to all teaching Cadre Posts like Masters,Post Graduate Teachers,Master,C & V,Principals and Headmasters.Posts of Ministerial Cadre, Block Officers, District Officers, Principal DIETs shall not be covered under the policy. Zoning of Schools-All Government Schools shall be categorized in seven zones. Zone 1-Schools located within Municipal area of the City of District Headquarters. Zone 2- Schools located within the 10 KM from the boundary of Municipal Area of District Headquarters. Zone 3- Schools located in the City/ Town of Educational Block Headquarters. Zone 4-Schools located on the State Highways or National Highways between 10 K.M. to 15 K.M. Zone-5-Schools located in the radius of 5 K.M. of Block Headquarters. Zone-6-Schools located between the radius of 5-10 K.Ms of Block Headquarters. Zone-7-All remaining schools located in the farthest area and not covered in above categories.